Credit and debit cards that do not require a signature when purchases are made are to be rolled out nationwide from Thursday. 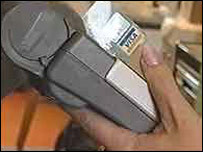 The decision comes after the so-called chip and pin cards were successfully tested in Northampton for three months. The new cards require consumers to input a four-digit code when making a purchase rather than sign a slip. One in five credit card users are expected to have the new cards by the end of the year and more than half of all cardholders are likely to have them several months after that. The microchip technology that is incorporated in the cards is designed to make them harder to copy. It is hoped that card fraud - currently costing £425m a year - could be cut by two thirds. The new technology is aimed at combating the growing problem of "skimming" - the most common method of counterfeit fraud. The magnetic strip on the back of cards is copied by fraudsters using a handheld card reader. The card can then be "cloned". The new cards have a thumbnail-size microchip, which stores personal data more securely than the magnetic stripe, making it harder to counterfeit. Finding out the pin number of a particular card is also much harder than copying a signature. The British Retail Consortium and the Association for Payment Clearing Services (APACS), which are co-ordinating the scheme, said that more than 40 million UK consumers would be using the system by 2005. "We tested chip and pin earlier this year and there is a real appetite for the new system among consumers. More than 80% of people in the trial said they were in favour," said Sandra Quinn, from the Association for Payment Clearing Service (APACS). Chip-and-pin cards are already common in some other European countries. "When the system was introduced [in France] it cut credit card fraud by 80 per cent"
So why did the UK have to wait for Pin credit cards?